The White Rabbit Pizza Co. has announced the launch of a brand new vegan pizza to its range of gluten-free pizzas. The White Rabbit Pizza Co., which was founded by three friends who are mad about Italian food, has announced the launch of a brand new vegan pizza to its range of gluten-free pizzas. Fresh out of their Artisan Bakehouse, Co-Founders Nick and Italian pizza maestro Matteo, are proud to introduce their latest hand-topped plant-based pizza, The Vegan Gardener (rrp £5). The Vegan Gardener is an epic combination of organic Italian vegan cheese, specially selected Cavolo Nero Italian Kale, pesto and sun-dried tomatoes on a beautifully thin and crispy crust. To ensure the gluten-free crust is high-quality, Matteo has personally sourced the finest Italian gluten-free flour blends to perfect his unique signature dough so everyone can enjoy amazing pizza – whether they’re vegan, coeliac or gluten intolerant. 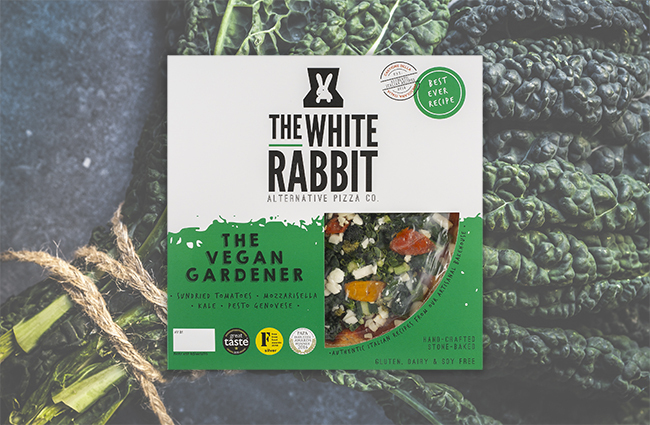 Not all of White Rabbit’s pizzas are vegan, but they are all gluten-free, and White Rabbit has developed its vegan range so Sainsbury’s can sell pizzas that are suitable for almost everyone. The White Rabbit Pizza Co. pizzas are available to purchase in Waitrose, Sainsbury’s, Ocado, Daylesford, Whole Foods Market, Planet Organic and a range of delis and independents.